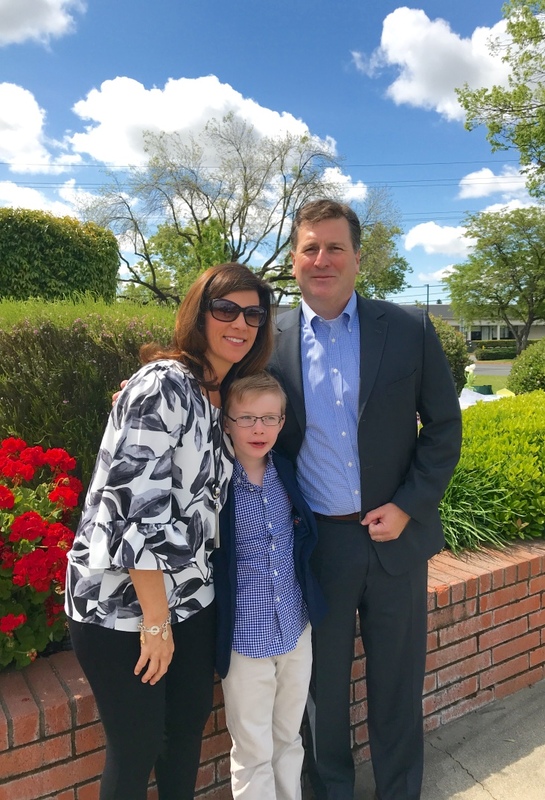 Beckett made his First Communion today at the 11:30 am Mass at St. Ignatius Church on Arden Way in Sacramento. This is the Jesuit church where Brandon Sr and I were married in 1964. Lisa, Beckett, and Brandon near the entry way to the church. As you can see, it was a beautiful day. 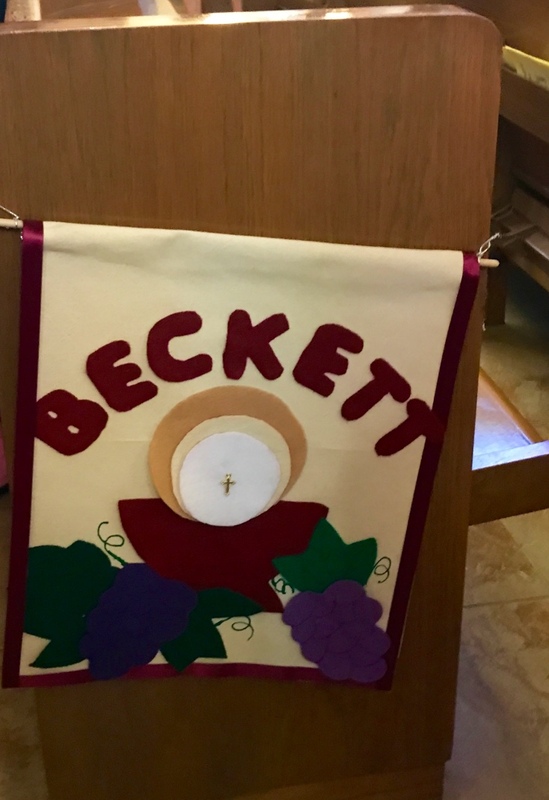 Beckett attended CCD classes this past year in preparation for the event. Lisa attended with him, and Brandon attended a couple of times when Lisa couldn’t. The 3 B’s: Barbara, Beckett, and Brandon. Girls alternated with boys as they walked in. Doesn’t Beck look angelic? 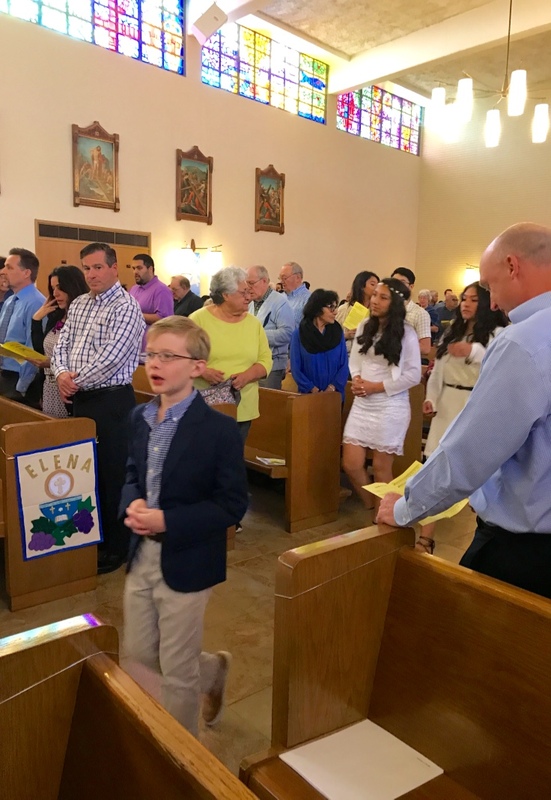 Each child made a banner to place on the end of the pew to reserve the pew for their family. 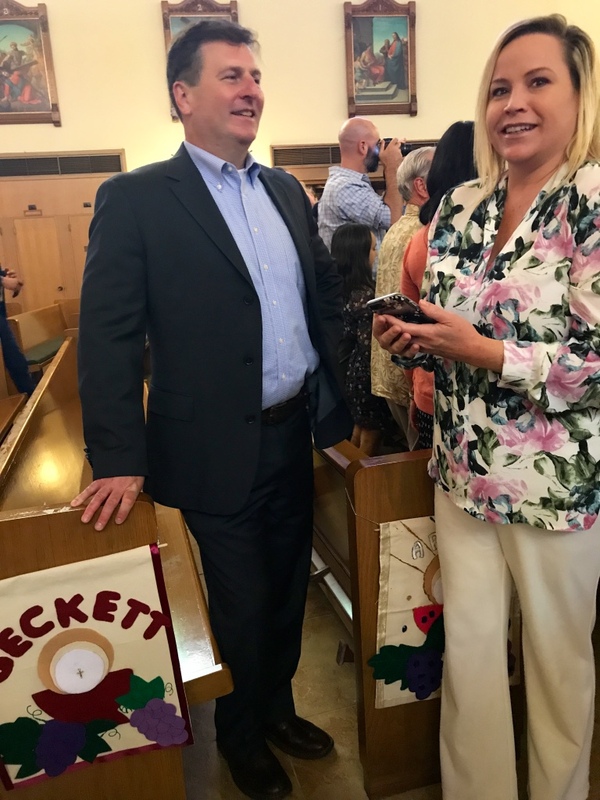 Brandon and Kim, Beckett’s birth mother, chatting after the ceremony. Kim drove up from Palm Springs for the ceremony. 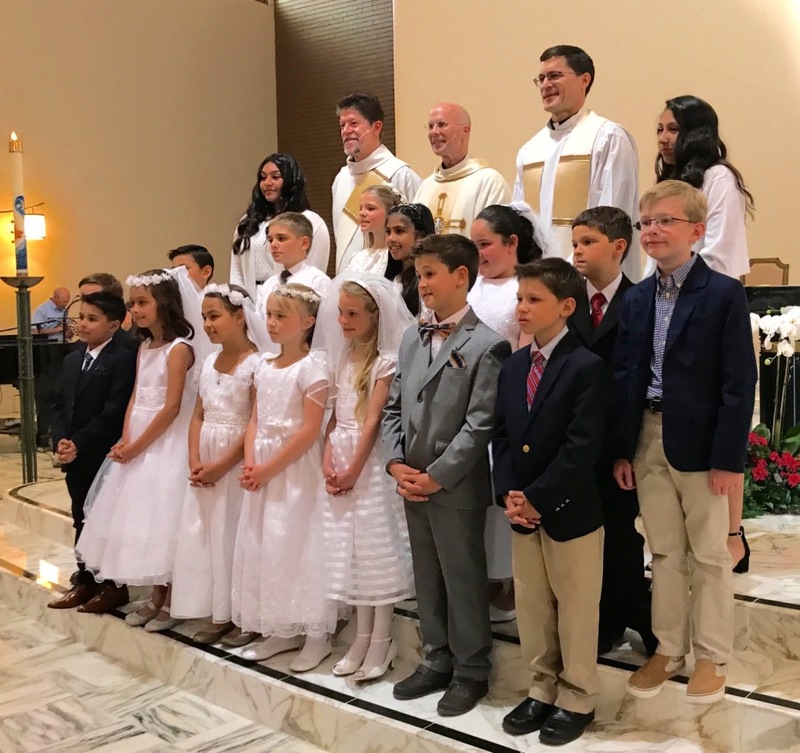 The group of First Communicants assembled after Mass. Beckett is on the far right in the 2nd row. The celebrant, Fr. 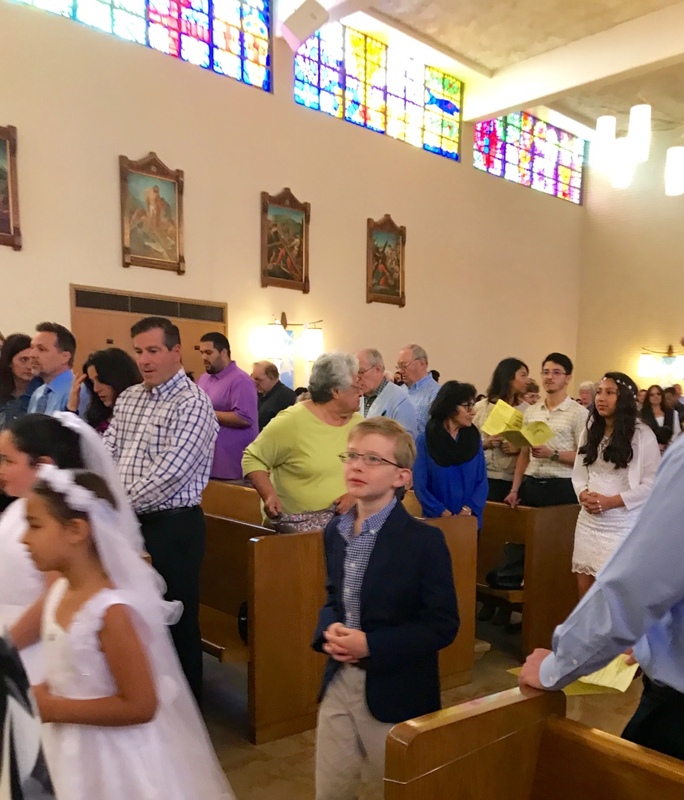 Art Wehr, SJ, is in the middle of the 3rd row. Afterwards, Brandon and Lisa hosted the family at Three Sisters Mexican Restaurant on Folsom Blvd. Lisa and Kim are waiting to place their order. Good chips, and I heard that the margaritas were good, too!! It was a beautiful, memorable day for all. The birthday cake was tiramisu from Bella Bru Bakery in Carmichael. 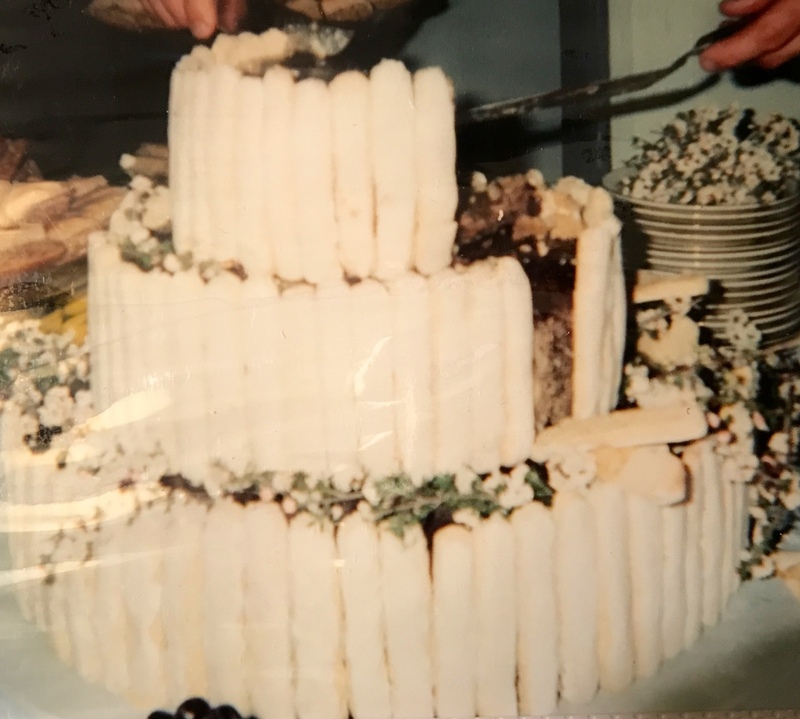 In 2001 there was a picture of a tiramisu wedding cake on the cover of a prominent magazine. Bella Bru copied the picture and made the cake for my daughter’s wedding. Guess who likes tiramisu? The gals sang Happy Birthday, Mary Claire. MC blowing out the candles. Dolores photographed Mary Claire at work. 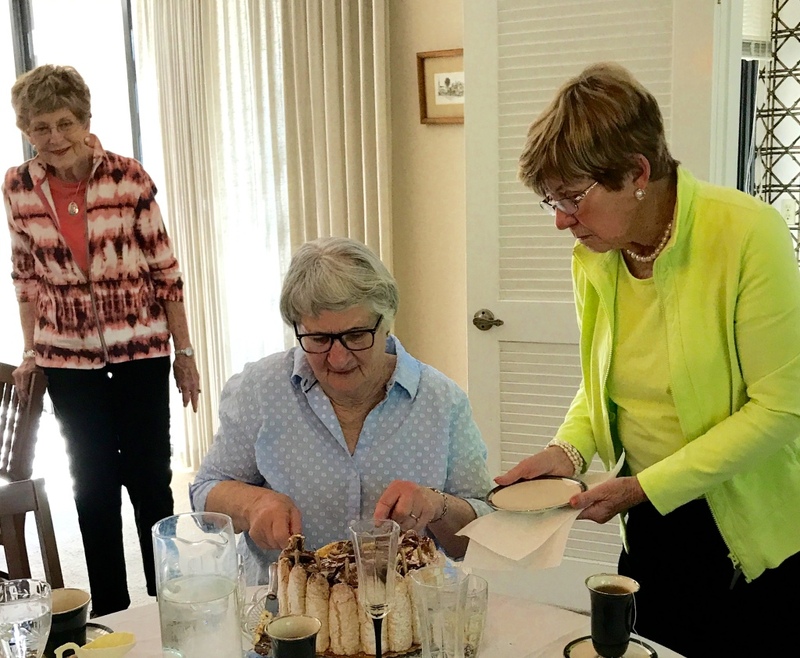 Nanan watched as Sue Pach helped MC with the cake cutting. 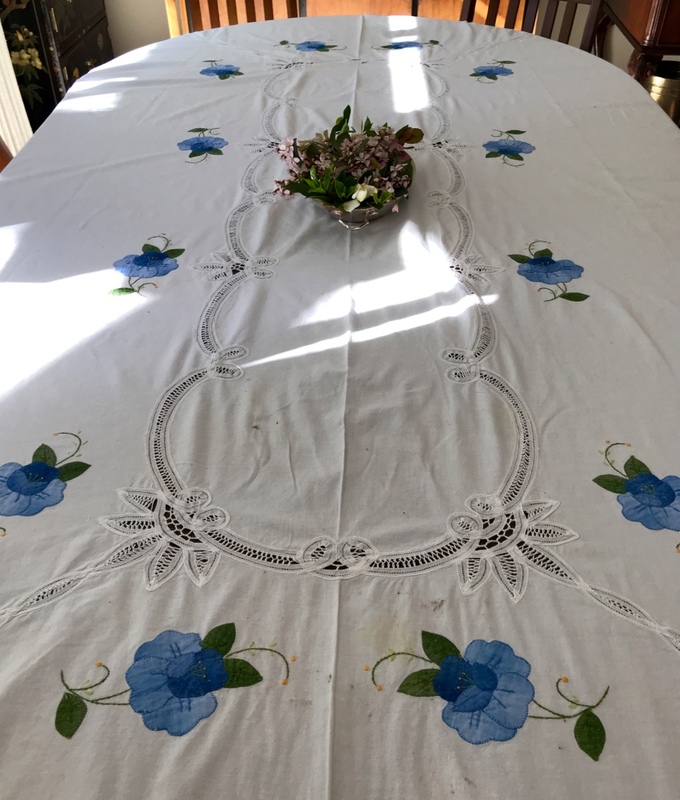 Sue was an invaluable help with clearing off the dishes, pouring coffee, and passing out the dessert. 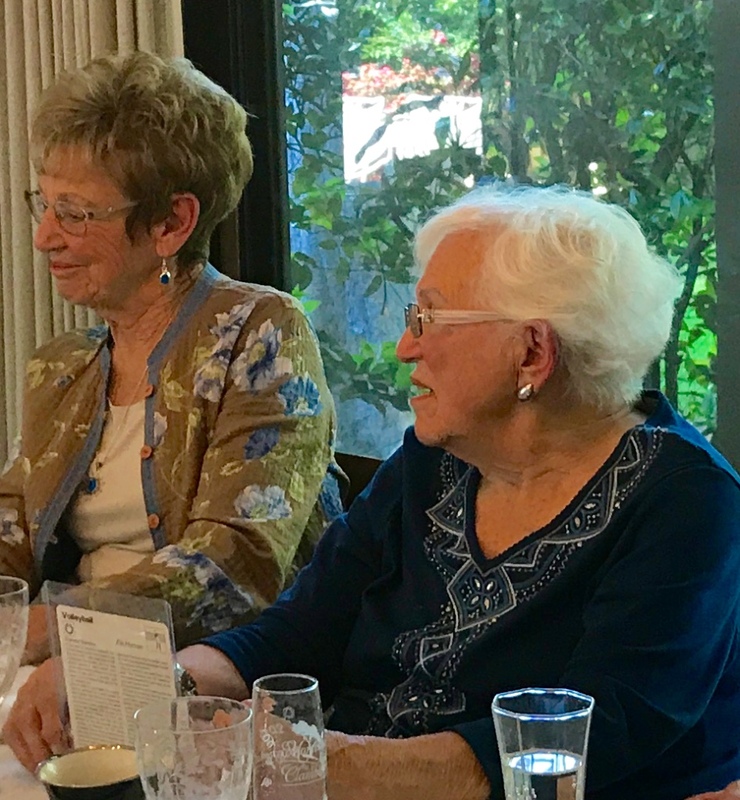 Sue Mecum, Sue Pach, Mary Ann Stewart, and Kathy Cunningham enjoyed dessert. 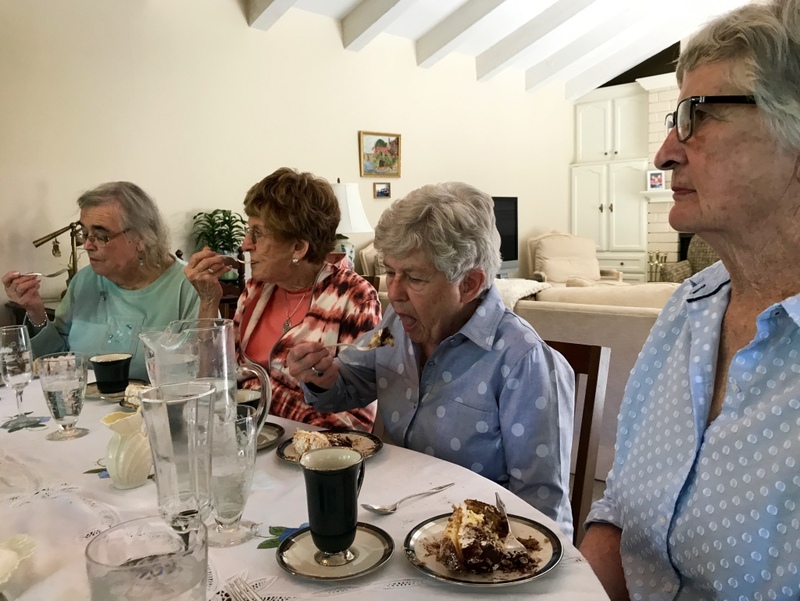 Kathy, Nanan, Dorla, and Mary Claire having dessert. 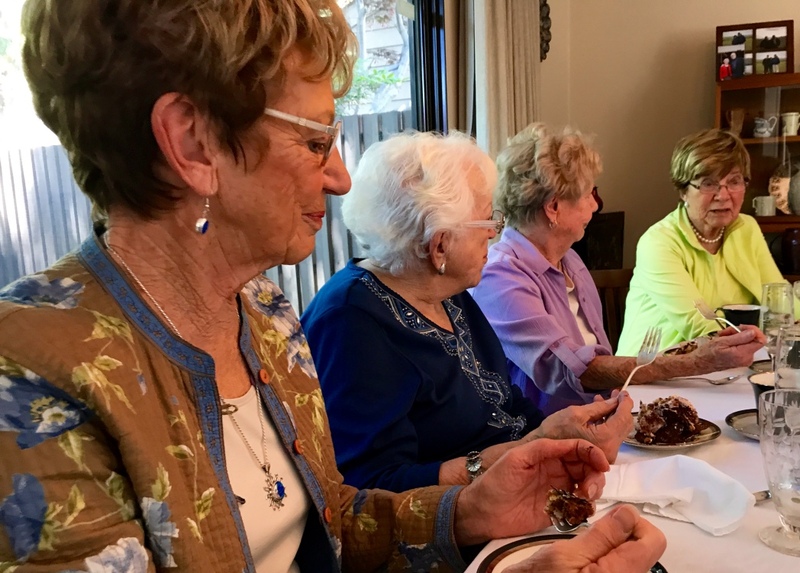 Dolores, Mary Mayer, Sue Mecum and Sue Pach busy with eating dessert. Now it was time to read the cards. There were 3 or 4 yellow envelopes, but no two cards were the same. 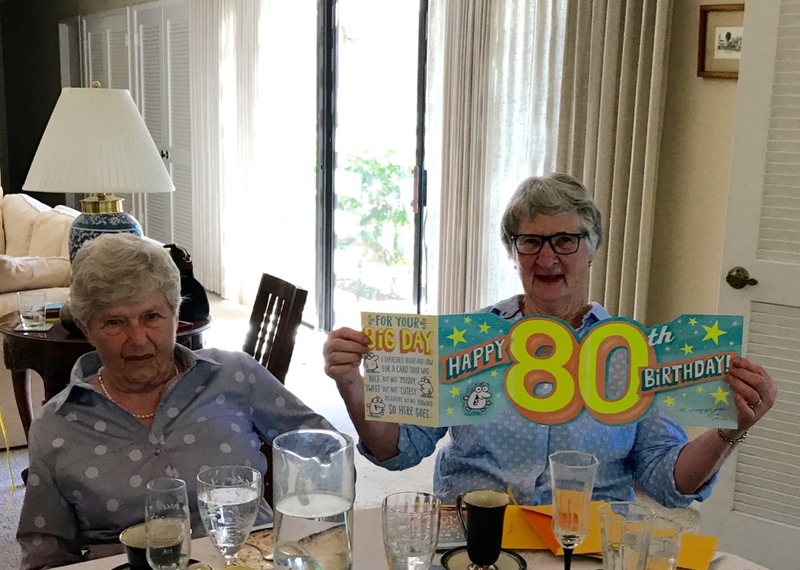 It wasn’t that easy to find an appropriate 80th birthday card. At one store, the numbered cards ended at 60, so I gave up on an 80th card. Clark joined the party for a few minutes to explain his Sportscaster cards which he collected in the 80s. 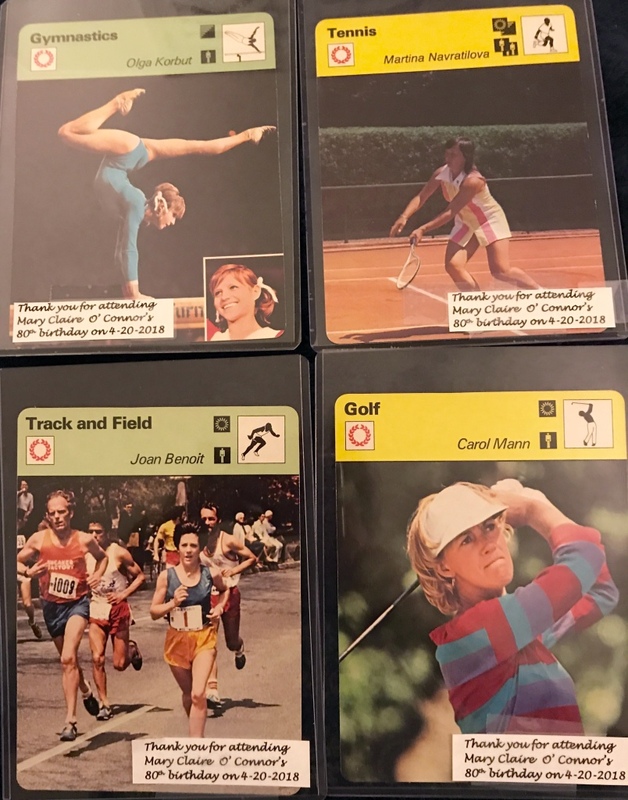 He had a pile of cards of women athletes which he passed around for people to take. 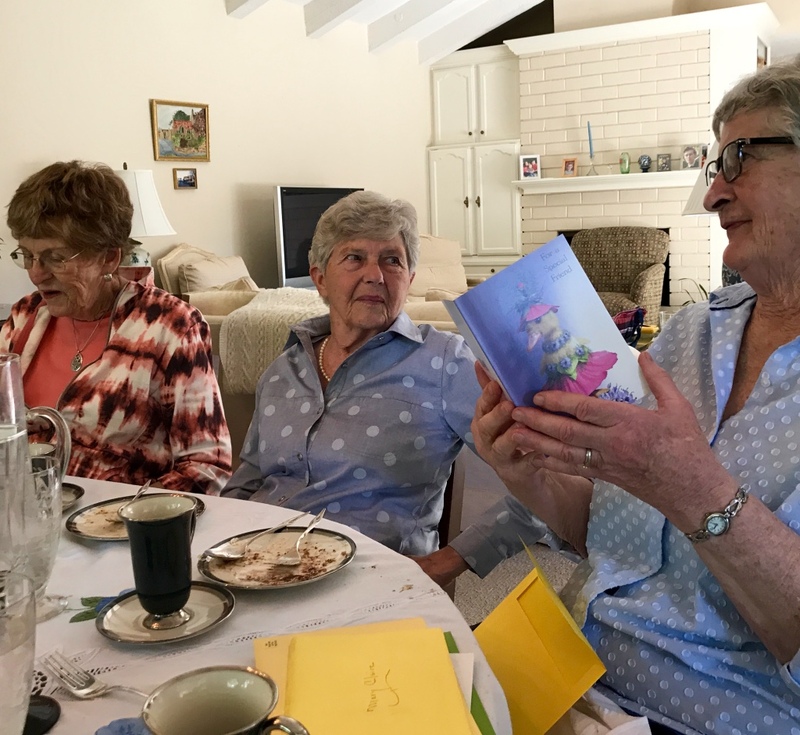 He gave Mary Claire a card of auto racer Janet Guthrie who also was born in 1938, the same year as MC. He also gave MC a card of the 4 Horseman of Notre Dame to take home to husband Jim, a graduate of Notre Dame. Mary Mayer selected a card of Flo Hyman, volleyball player on the US Olympic team in 1984. Mary discovered that Flo grew up in Inglewood, as did Mary. And Flo attended El Camino Junior College in Torrance, as did Mary. Here are some samples of the cards. Clark made the labels thanking people for coming. 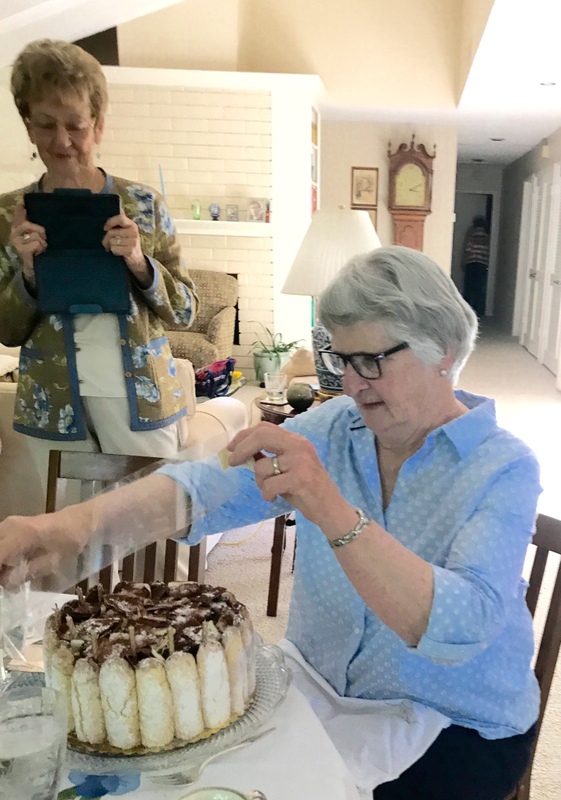 Mary Claire O’Connor, the baby of our former social bridge group, turned 80 on Friday, April 20, 2018. She was by far the best of our group at remembering what cards had been played. Our group played bridge once a month for 46 years from 1969 until 3 years ago. 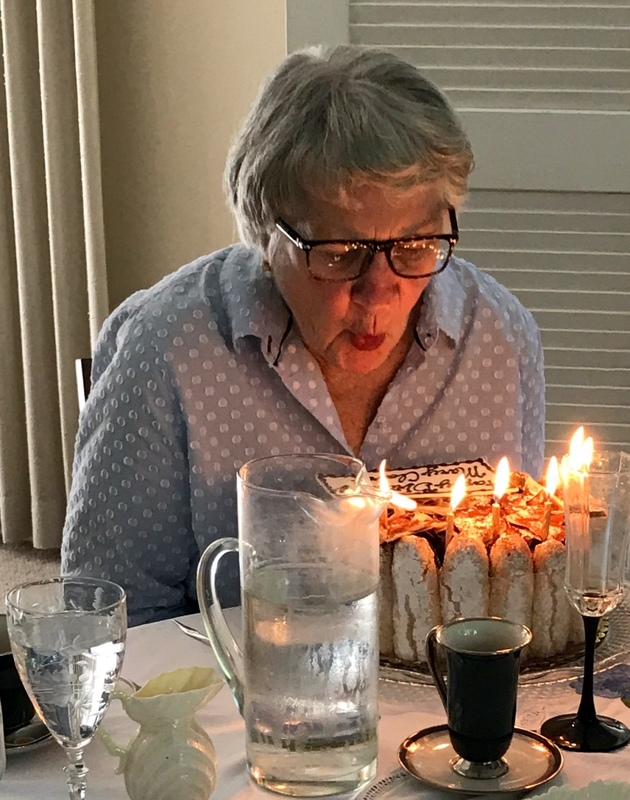 Since then Mary Claire has frequently invited us to have lunch at North Ridge CC to celebrate birthdays. At the end of the lunch, Mary Claire usually passes out a round of homemade black bottom cupcakes and give me extras to bring home to Clark. She also used to frequently bring chocolate chip cookies to Erin. 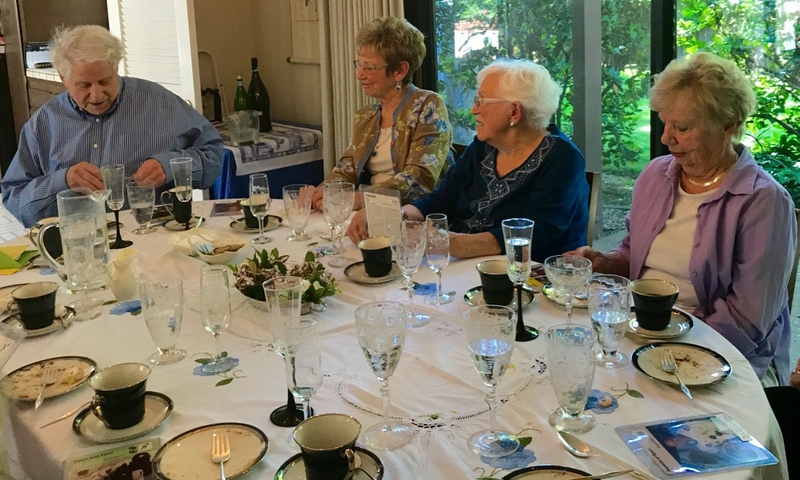 I invited those who could, to come to lunch to celebrate Mary Claire’s 80th. Also, I invited 5 of her friends who used to substitute in our group. Mary Claire plays in other groups with them, and she is the baby of those groups, too. 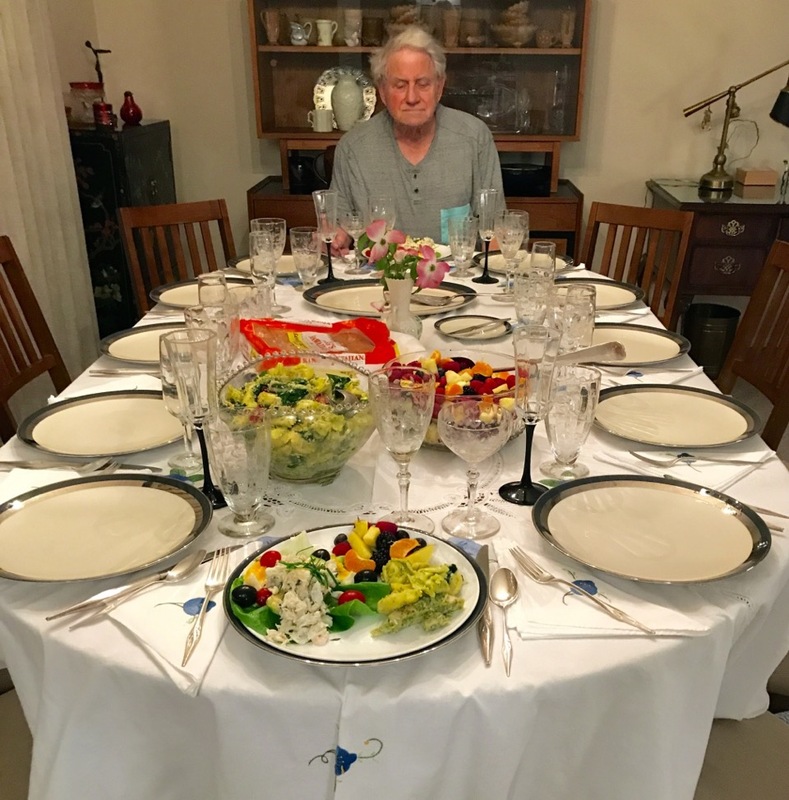 Mary Claire knew we were meeting for her birthday, but she didn’t know of the 5 additional invitees. They were a lively group and a lot of fun. We gathered from 11:30 until 3:15. Dorla Morse, Dolores Underwood, Mary Claire, Mary Mayer. 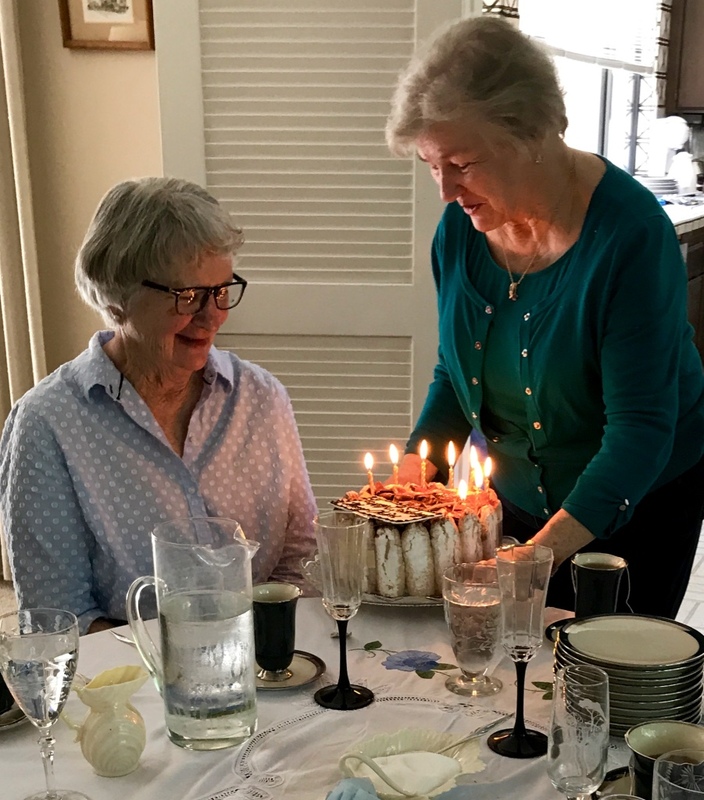 Dorla played bridge with Mary Claire on Thursday at North Ridge and didn’t want to spill the beans, so Dorla didn’t even wish MC an upcoming Happy Birthday. Dolores and Mary are neighbors of Mary Claire’s. 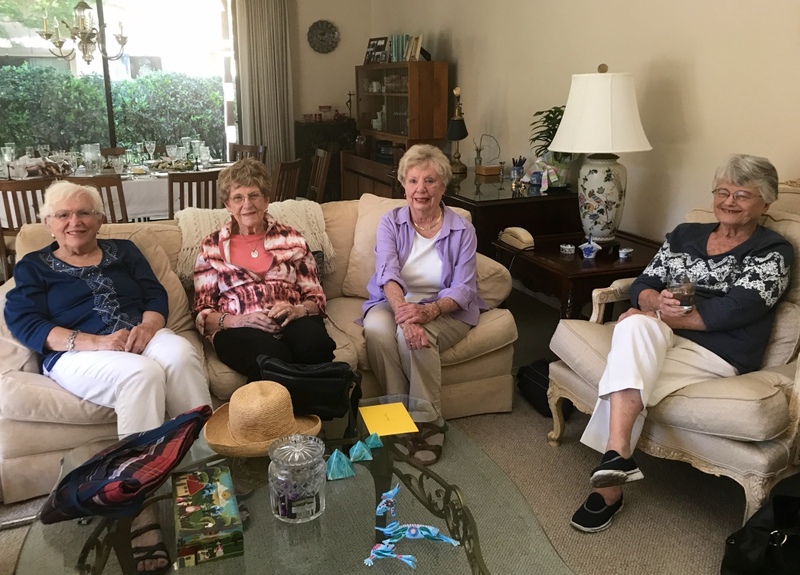 Mary Mayer, Nanan Buchell, Sue Mecum, Mary Ann Stewart. 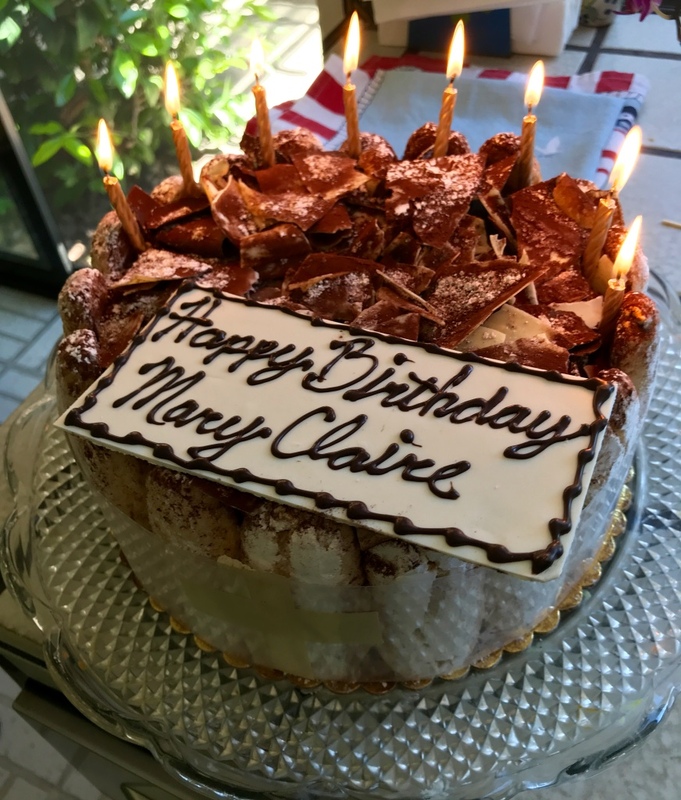 Nanan also saw Mary Claire Thursday in the bridge room at North Ridge and avoided wishing MC a Happy Birthday. Sue Mecum is an original member of the social group. She and her sister have recently moved about 3 blocks away from me. Sue went to Oaxaca with my sister Patricia and me 15 years ago to study Spanish for a few weeks. 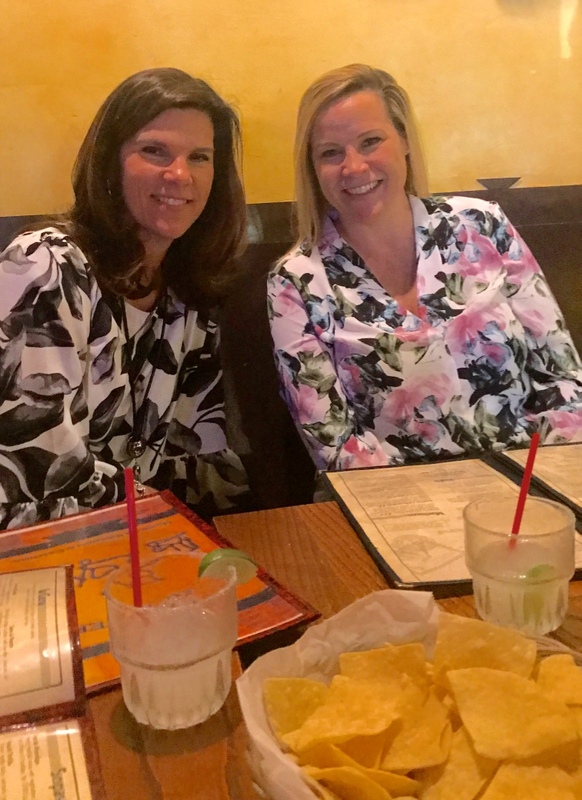 Kathy Cunningham and Sue Pach. Kathy was one of the original members of our social group. 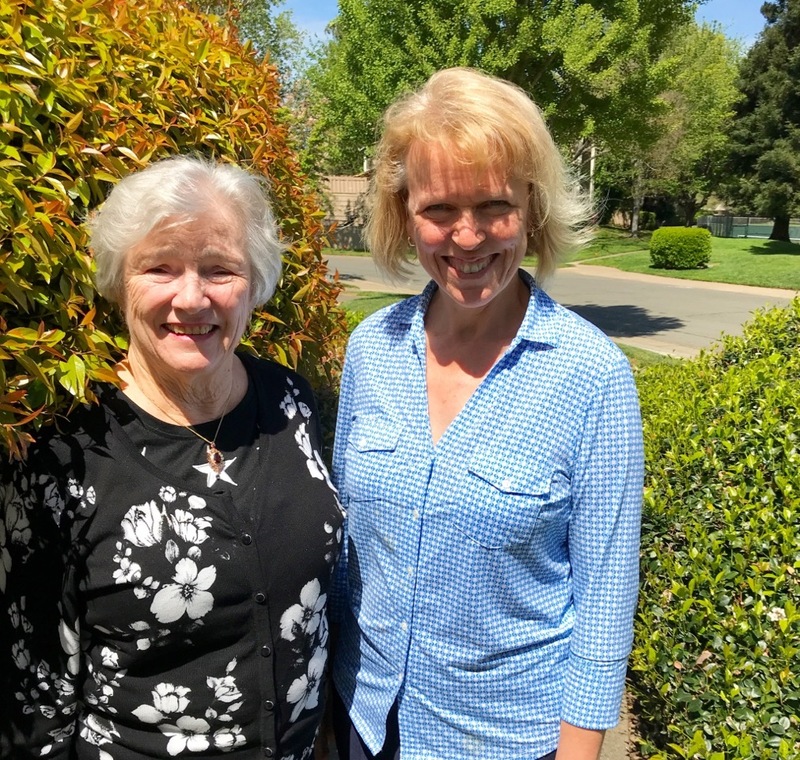 She and Mary Claire moved to Sacramento from Portland while I was in Oakland with my broken leg in 1961. 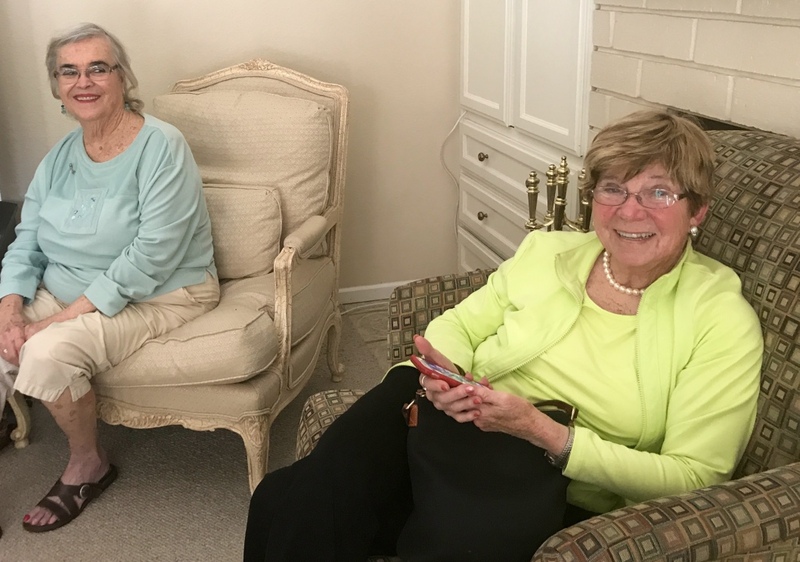 Sue Pach and Mary Claire played in the Notre Dame wives bridge group and used to play golf together at North Ridge. Sue Pach and I met in 1971 when our children were on the Carmichael Beavers Swim Team. Her son Joe and my son Brandon were in kindergarten together. Clark was hungry Thursday night and he wanted to go out to eat after bridge, but I wanted to come home to finish preparing the salads. So, I fixed him a plate: crab and shrimp salad on an avocado half, fruit salad, tortelini-chicken-spinach-pesto salad, and roll. The group about to eat. 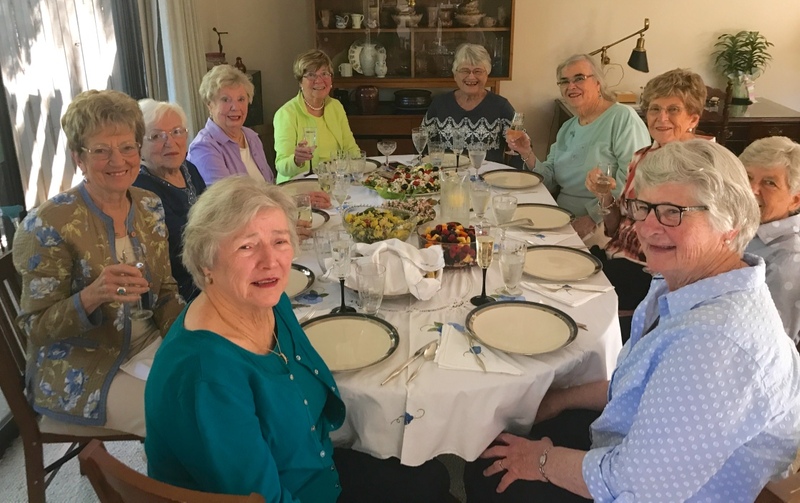 Clockwise from me (bottom left) Barb, Dolores Underwood, Mary Mayer, Sue Mecum, Sue Pach, Mary Ann Stewart, Kathy Cunningham, Nanan Buchell, Dorla Morse, Mary Claire. I had a text message from Steve yesterday saying that Paco was just accepted into the SciMaTech program for the high school next year! Paco turned 14 on Feb. 29th, so heads to high school in the Fall. Readers of this blog will note that the most frequent commenter to the blog is Barbara Chase. 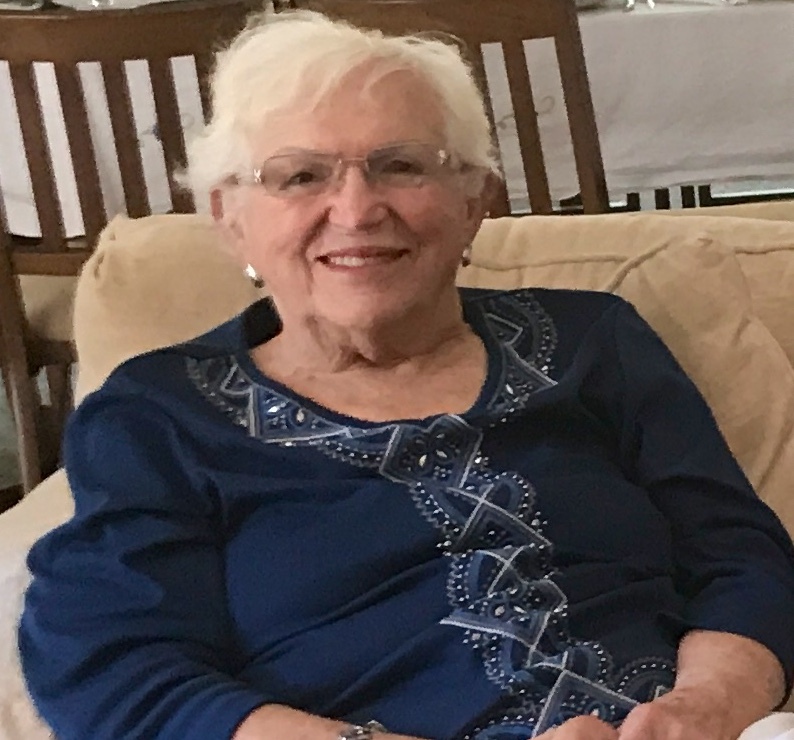 Barbara and I met when we entered Holy Names High School in Oakland in the Fall of 1948 and by our Sophomore year had become fast friends. 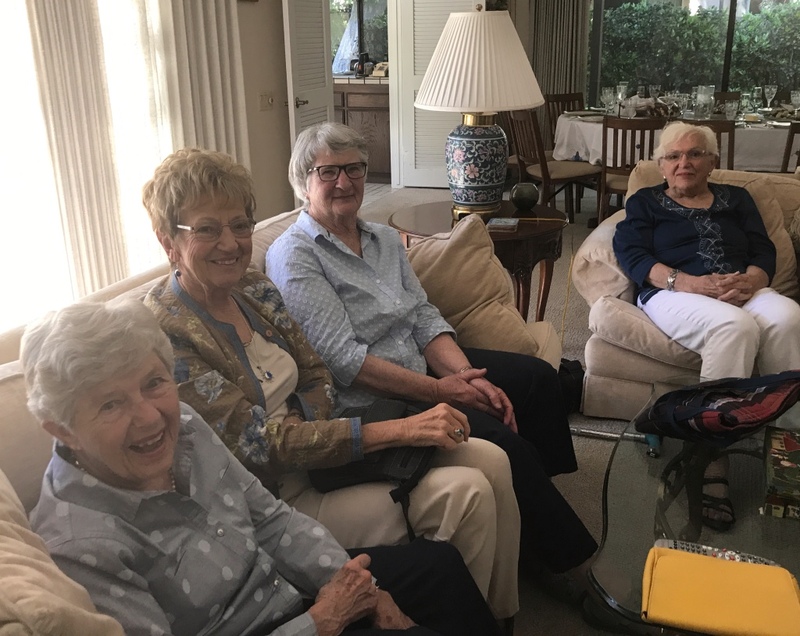 We went to different colleges, but kept up the friendship for almost 70 years in spite of Barbara’s living in the Northwest for most of those years. 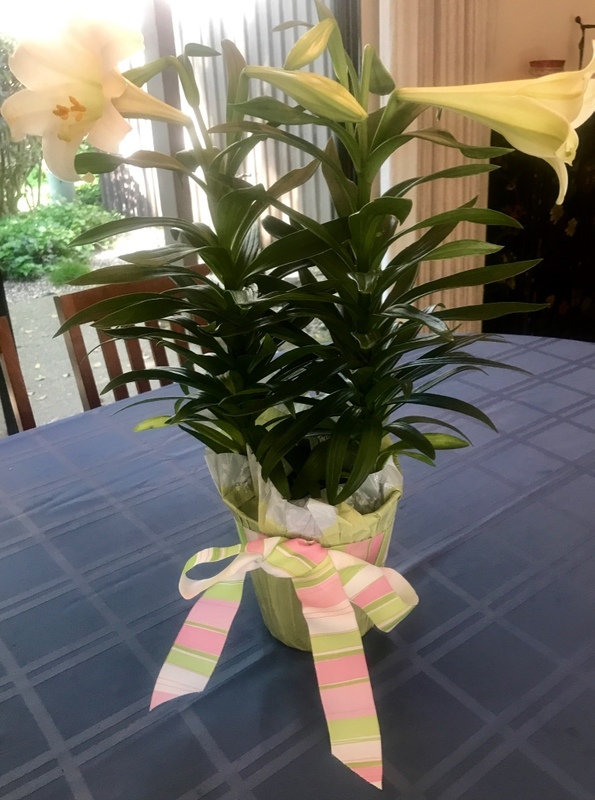 I was so excited to receive a call yesterday afternoon from Barbara’s daughter, Jeanne Tiscareno, who lives in Seattle. 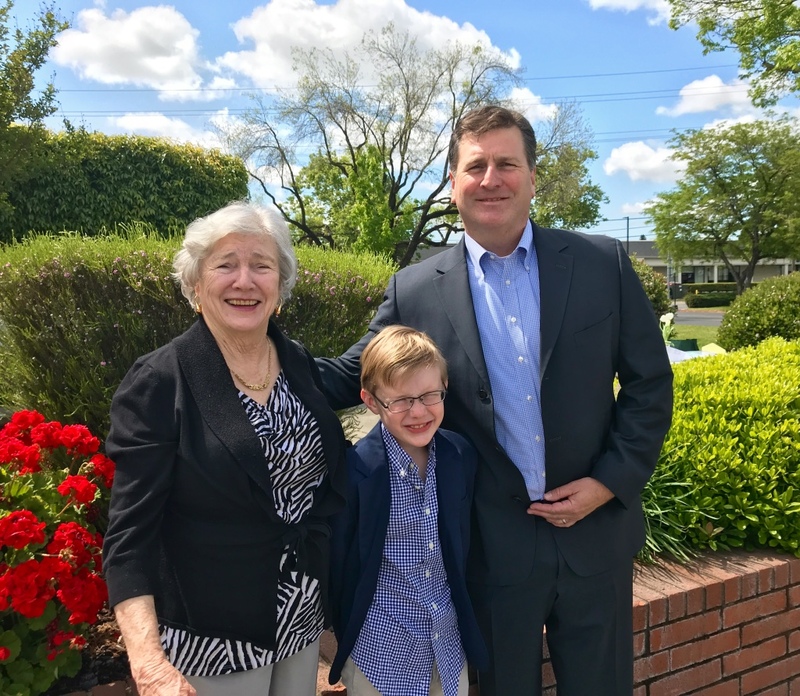 She and her husband Bob and son Dan were in Sacramento for a Junior Golf tournament at Haggin Oaks. Dan is 17 years old, a high school junior, and is hoping to go to college on a golf scholarship. I am impressed: he has a handicap of 0.14. But, he was not happy with shooting a 77 yesterday at the MacKenzie course at the Haggin Oaks complex. 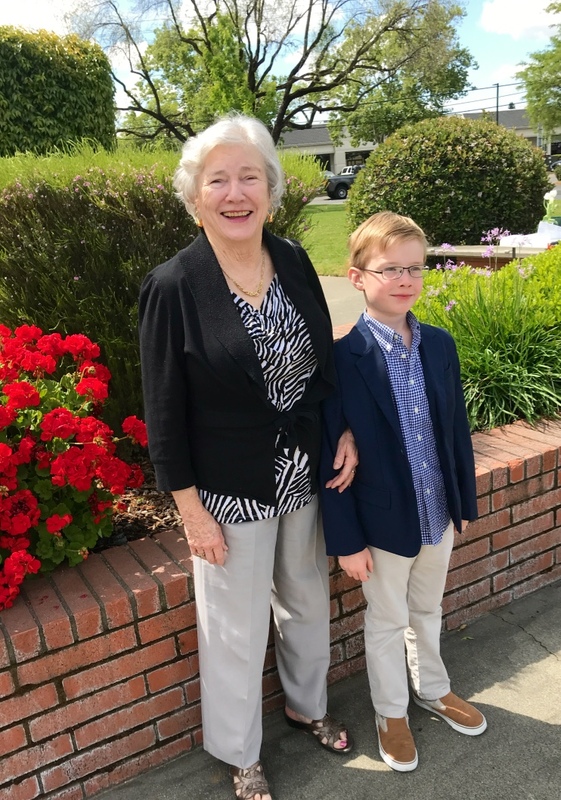 Jeanne came over for brunch this morning and we had a wonderful visit. She is very vivacious and a great conversationalist, so between her and Clark, I didn’t have to say a word! Clark was about to take pictures of his thumbs again, but I managed to show him where the lens was so that he avoided the thumb selfie. Barb and Jeanne in the bright sun. It was too windy to eat outside. Jeanne in front of a xylosma bush. 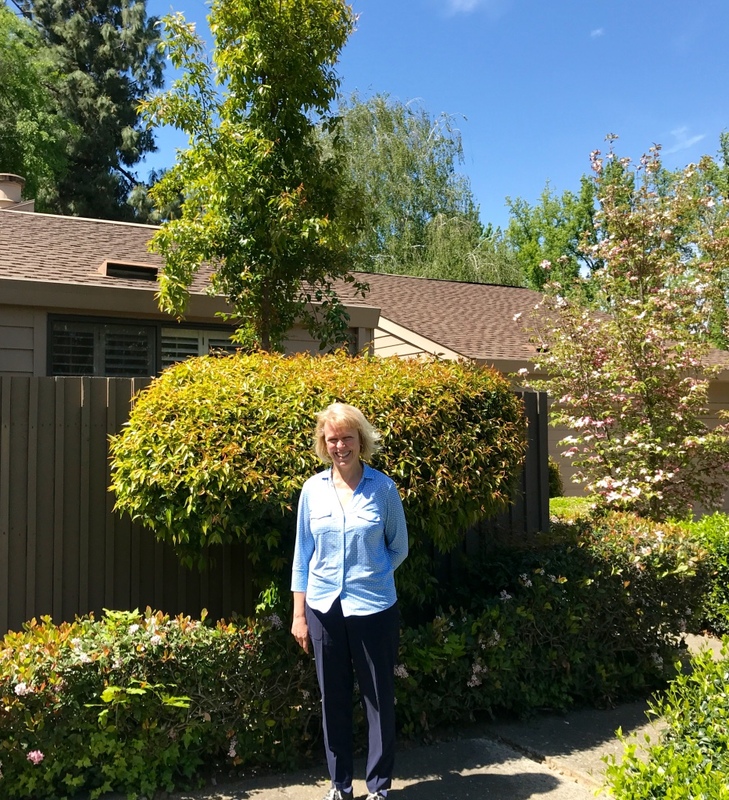 When Barbara Chase visited about 15 years ago, she was impressed with the xylosma. Barbara is an avid gardener and they do not have xylosmas in Edmunds, outside of Seattle. For my birthday that year she sent me a xylosma plant for the patio (behind the fence). I didn’t get around to pruning it for the last year, and it had overtaken the patio. A couple of months ago we pruned off five or six 15 foot branches, but left the branch that was growing vertically. We now have a xylosma “tree”. 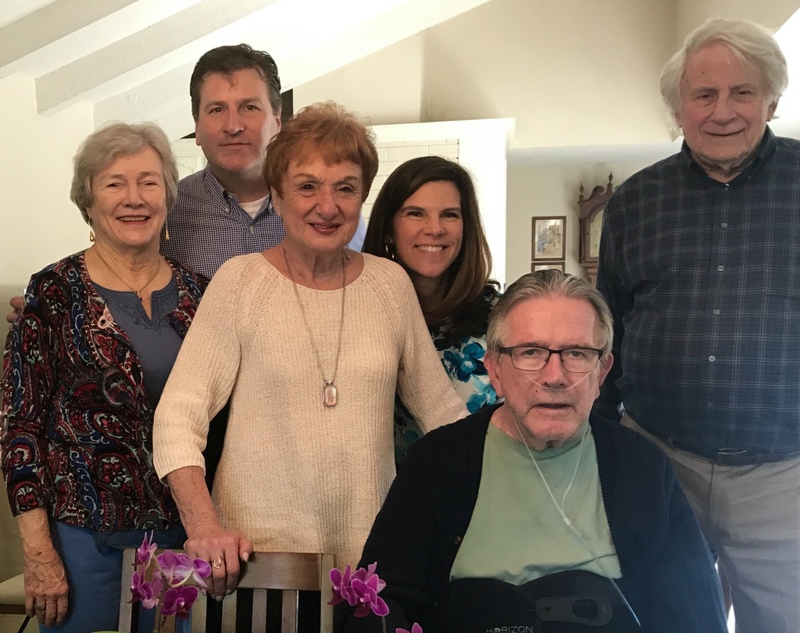 Brandon, Lisa, Beckett, and Lisa’s parents Chuck and Joleen Hecht came for brunch this morning. 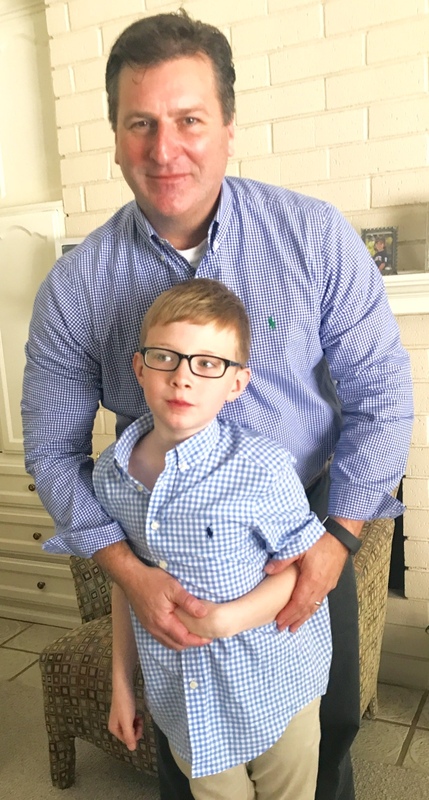 Brandon and Beck wore coordinating blue checkered shirts. 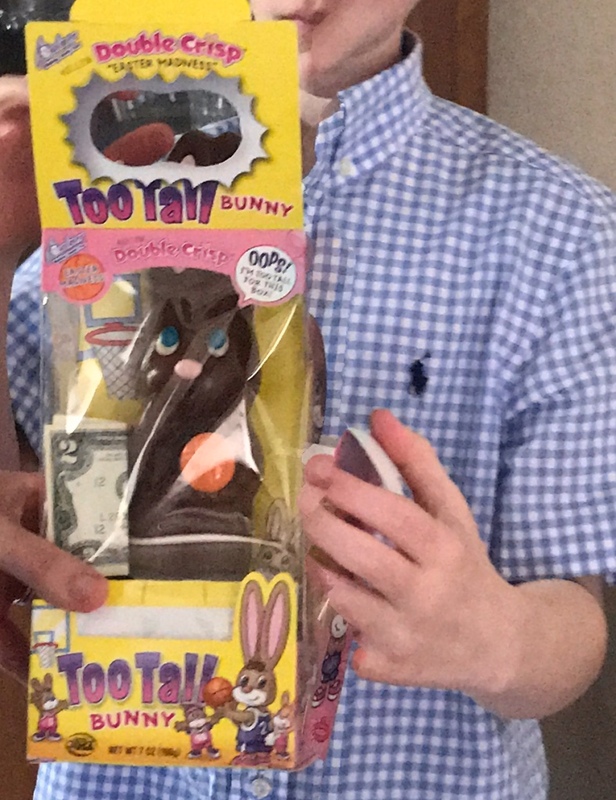 The Easter Bunny left a chocolate “Too Tall Bunny” with ears sticking out of the top of the box. The bunny was carrying a basketball. Clark slipped a $2 bill into the box. 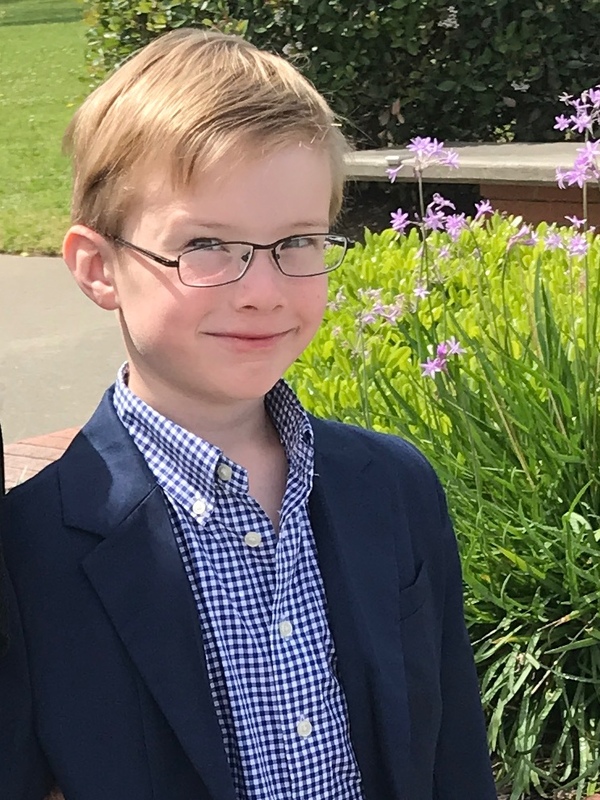 The photographer for this picture was 8 1/2 year old Beck.